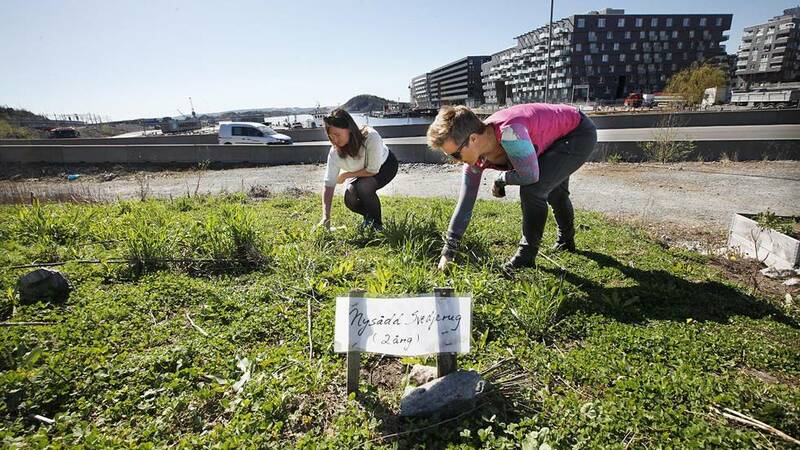 In Bjørvika neighborhood in Oslo city center, you can soon visit a meadow where organic potatoes, vegetables and herbs are grown, and farm animals wander around your feet. Located near at one of the busiest junction roads in Oslo, a green, calm meadow will welcome children and adults to learn more about how to grow food and care for animals. Artist collective Future Farmers, led by Amy Franceschini, are initiators behind the project. – The symbolic value of having a meadow in the city center is heavy. This art project involves people in a completely different way than, for example, a sculpture does. Many might think that this is art in an unusual way, but we think it is very exciting, says Anne Beate Hovind, manager of art projects in Bjørvika Utvikling (BU) to Osloby.no. The Losæter is a city meadow that will be established this spring in Loallmenningen, one of Bjørvika’s new public areas. BU has invited several artists to contribute in the Bjørvika project and elsewhere in Oslo. They have chosen to go back in time, to the roots of the modern town. The location is inspired by the Lo River’s significance as the origin of Oslo, which historically was a fertile area. It is here art, agriculture and food production will meet. The meadow will consist of a smokehouse with ovens, topsoil, fields with ancient grains and various activities organized by the artists. All they need is a motivated milkmaid and a herdsman who can contribute on the farm during the summer months. Eventually, they will also engage a farmer. – It is more than just growing food; it is about a social commitment. Having a meadow right in the city make sure we are reminded of how important it is to question the food production, and learn about how things are connected, says Hovind. She says that animals from Bygdøy Royal Estate and the Bogstad Farm will come to visit, and that there will be possibilities for summer jobs. The Losæter project has been exhibited all over the world, including the United States. The initiators hope that it might provide energy for more creativity and other exciting projects. Similar projects have had great success, including one in New York and San Francisco.